Minus two and a half degrees this morning, ice everywhere. Toddington yard was heavy with the lazy thick smoke from a recently lit fire in Foremarke Hall. While we sat in the mess coach, the whole carriage started to shake rhythmically. What? It turned out to be the green class 37 being started up, that is some big motor. Smoke was everywhere, and the green thing popped and spluttered. The low early morning sun made attractive scenes which unfortunately your blogger was unable to capture. For, as he took out his camera to capture the atmosphere to share with you, the camera seized up with a lens error. This is the fate of all the cameras used so far, as the retracting lenses do not like the dust that accompanies the building and PWay activities. Usually they last a year, this one rather less. Bang goes another £160. As it wasn't very windy today, the work in the great outdoors at Broadway was actually quite bearable, and we had a full complement of volunteers. No fair weather friends here. The sun was out, and it was interesting that while the ground was frozen, it was on the heights such as Dumbleton hill that some snow had clung, but not down here on the plain. There was a striking line between the two. Although we had advanced the two (three actually) rail heads to the ends of the future southern turnout, there remained a lot of work left to do on them - straightening sleepers, clipping up, finding and distributing plastics and Pandrols, cutting flame cut rail ends off and drilling to fit fish plates. At the end of the morning the most recently laid track looked a lot better, although the length by the goods shed still needs clipping up, as we ran out of Pandrols along there. Note for the next person to come up from Winchcombe! There are still a couple of dumpy bags of them down there. After lunch al fresco Steve in the JCB and Alan in the Telehandler started to bring up from the supply train at Childswickham the components of the last remaining turnout from Laverton loop. This is what we all wanted to see! We laid out the first 24 timbers, and then it was time for the serious stuff - the rail! By the end of the afternoon, and it soon gets dark now, we had the first two switchblades in and bolted up. Standing at the southern end, you could see where it is all heading to now. There is a clear line departing to the left. Amusing anecdote of the day: Neil had a go at disk cutting a rail end off. He was soon emitting a huge meteor of sparks behind him. With your goggles on, the ear protectors and the noise you are in a bubbleof your own there. Suddenly Tim shot up and started hitting Neil's legs like mad. Neil killed the engine, took off his goggles and ear protectors. Neil: Why are you beating the c***p out of my legs, Tim? Tim: You are on fire, Neil! So, next to a new camera, it's also a new pair of jeans. The joys of laying track. George Bryant took a number of photographs in the goods shed area, which he is kind enough to share with us. George was the former signalman at the little Moreton in Marsh signal box, until it closed a year or more ago now. 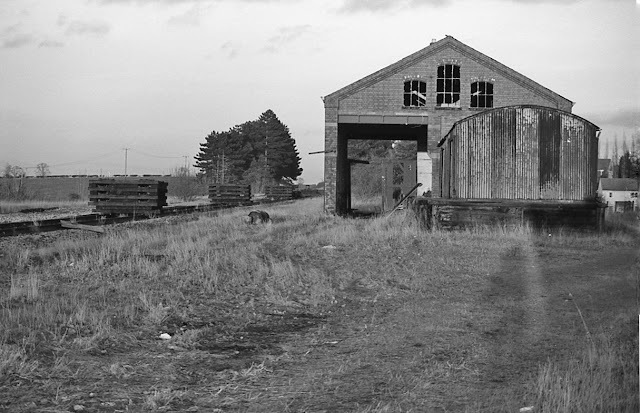 Now George is an active volunteer in our S&T department, and no doubt never imagined that, when he took the pictures below, he would one day help to rebuild a signal box at Broadway. Here are some of his pictures, taken in 1979 during the lifting of the track by BR. 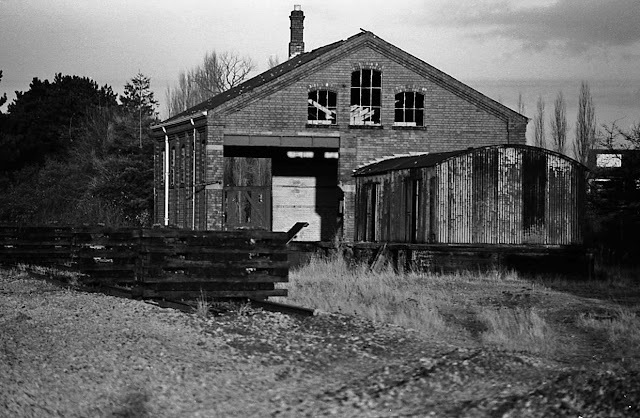 Broadway goods shed, with its corrugated iron packing shed in front. 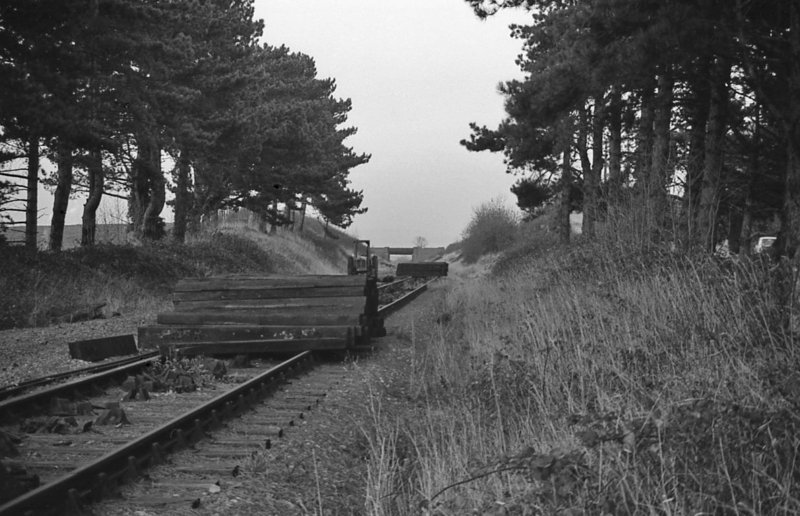 The same view from the end, also showing the up line lifted and sleepers stacked on the down line. We have just relaid this stretch. Lifted sleepers on the down line, which is already in poor condition. The line had closed 3 years earlier. The down line and stacked sleepers in the confines of Broadway station itself. The main buildings used to stand beyond the pine trees on the right. Springfield Lane bridge is in the distance, now our northernmost border. 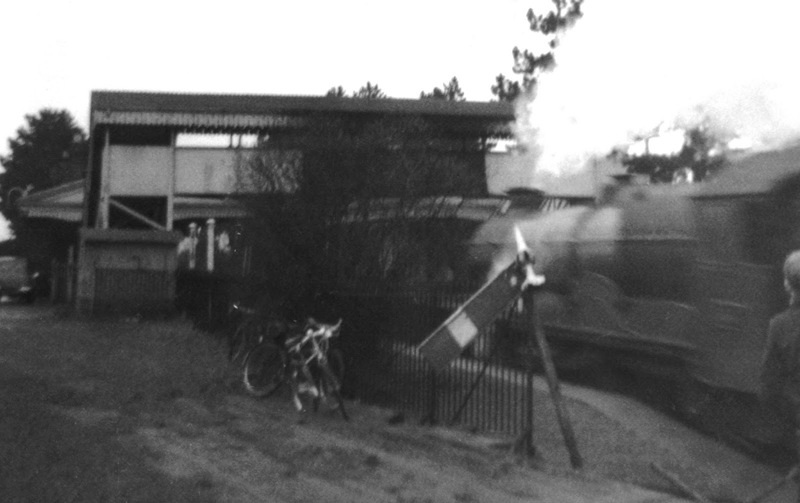 This one's just a fuzzy snapshot, but illustrates well the atmosphere when the gang of teenagers would cycle down to the station to watch (and crudely photograph) the trains that went by. 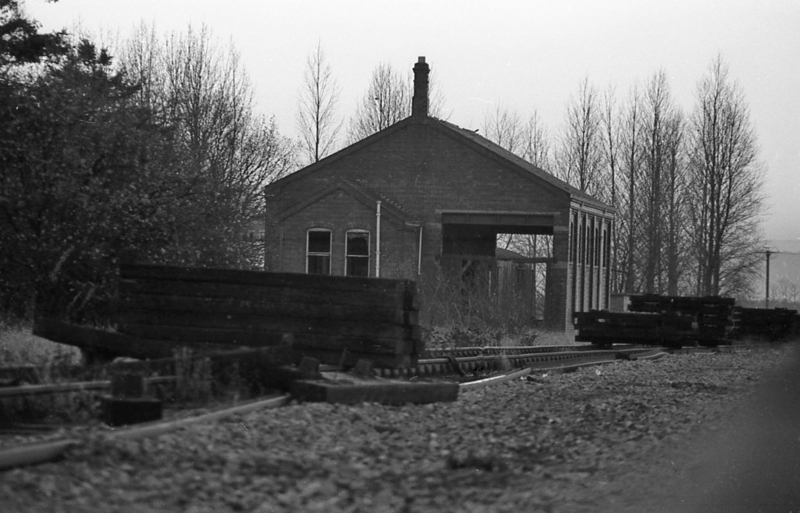 The station is already closed (the running in board has been taken down) but the buildings are still there. This dates the photograph to somewhere between March 1960 and November 1963. The boys came on their bicycles, which are parked up by the fence. Someone has taken parts of the dismantled signals and stuck them on the end of the spearhead railing fence leading to the horse dock, behind the camera. As soon as the Amazon drone delivers a new camera, reports on the extension work will resume with pictures. Next week Monday is a supplementary work day preparing the 1000m stressing job, Tuesday is the stressing itself, and Wednesday is the Mega-Clippathon, with our very own train confirmed. That will be fun, and very atmospheric. Many thanks for the latest news. I had forgotten that today is Saturday, and that you usually post on a Saturday. Very sorry to hear about Tim catching fire, but these things happen, I suppose ! I hope he feels none the worse for it. I'm very glad the weather was not too unkind to you. But lunch al fresco at this time of year ! It made me shiver all over just thinking about it. So you're now assembling the southern point. My word, you don't hang about do you. You're a wonderful lot. Good luck with the next clippathon, and all the fettling, stressing, welding, and ballasting to follow. I know it's obvious to say so, but there would be no railway without you. Thank you all for your wonderful work. Sorry, I meant Neil, not Tim ! Please excuse the mistake. I suppose in my case, you can put it down to old age. Other makes are also available, some of which cost more. Not sure where George got his information from, but Moreton-in-Marsh Signal Box is still open! My mistake, don't blame George. Glad to hear that. Some time in the early 1990s my then girlfriend and I blagged our way into the box where a friendly signalman allowed me to pull off the home signal on the down line, with some difficulty. I wonder if George Bryant was working there at the time? Happy days! Many thanks for the blog from a modest shareholder. You may be a modest shareholder, but it all helps. I'm a modest shareholder too in - 4253 ! Am I right in thinking you first saved the loco? Jo. Thanks for remembering me. I can't take much credit for saving 4253. It was mostly down to the people on the P&BR providing a home for it for twenty years, and now to the group at Rolvenden with their knowledge and dedication. Hope to see 2874 running into Broadway one day. Ouch! A nice longer term addition but not essential to start operations at Broadway then! Although the Mid Norfolk Railway have had a left hand one advertised for sale (on http://www.wnxx.com/forsale/index.htm) at £6,000 or ono for ages and not found a buyer. A left-hand turnout is what is needed, yes? Is it compatible, or doesn't it matter? ("Just" adaptor fishplates at each end?) I guess the timbers might cost half as much - or more - on top, plus the transport... I bet we could crowdfund it if the PWay lads could lay it... Nothing seems to be beyond this lot! Shame,about your camera,expiring on you!.I,had a look at Nigel Black's Flicr pictures,showing the start,of the Southern turnout!.Lets hope,that this snow,does'nt hang around,for your clipping and stressing activities,during the week!. Anthony. Yes. Sorry to hear of the early demise of your camera. (indent to Santa for a new one). Great reportage nonetheless. If one has a vivid enough imagination one can see through the lines (of print - not track). I could literally see poor Neil catching fire, and due to the fact that he wasn't hurt, I laughed out loud! Hope Neil saw the funny side when flames were extinguished! Regards, Paul. I've just looked at Broadway's security camera. Bet you're glad you were laying track yesterday rather than today. Only rain down here in Cornwall but verrrry cold! with the odd (very odd), outbreaks of sunshine. Regards, Paul. About 6ins in the blogger's back garden here in N Glos. Tomorrow's preparatory track work is cancelled. How can you distribute Pandrols and plastics if you can't see the track? Did you take any pictures of passing trains? We would love to see them.